The school presented their production of The Sound of Music from Monday, July 16th. to Wednesday, July 18th. 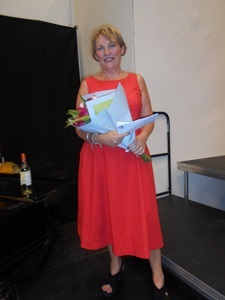 I was pleased to attend the final performance. 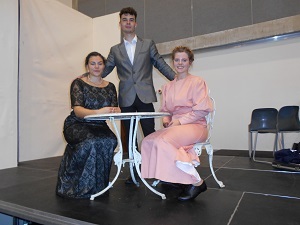 Many people will be familiar with the story of Maria and the Von Trapp family as well as the many songs from the musical, but this was a freshly exciting production directed by Mrs Helen Simmons, Head of Drama, in which many talented young people took part. As many of the roles were very demanding it was necessary to have three different casts (for example there were 20 von Trapp children) which undoubtedly made rehearsing challenging and intense. However, in the past all Bishop Ramsey’s musicals have always been of the highest standard – this one did not disappoint. Maria is a postulant in Nonnberg Abbey in Austria but it soon becomes obvious that she is not yet ready to embrace religious life – she loves being out among the mountains. Mother Abbess is sympathetic and agrees that she should spend time outside the Abbey and return when she feels ready. Maria becomes governess to the seven Von Trapp children. Their father, Captain Von Trapp, a widower who masks his grief by running his household as if it were a military regime, informs Maria that they will have lessons in the morning and marching in the afternoon! He then leaves for Vienna. However, Maria teaches the children to sing and dance and enjoy life once again following the death of their mother. They learn to love and trust her. When the Captain returns he brings with him Baroness Elsa Elberfeld whom he intends to marry. Maria becomes aware that she is falling in love with Captain Von Trapp and, without giving any explanation, returns to Nonnberg Abbey. Once again Mother Abbess gives Maria good advice. She explains that she can still love God while marrying and having a family – there are different kinds of love that can exist side by side. Maria returns to the Von Trapp home much to the delight of the children but Baroness Elberfeld makes it clear that she is not happy with the situation. Captain Von Trapp’s attitude gradually softens; he realises that he loves Maria and begins to enjoy singing and dancing once again with her and his children. Baroness Elberfeld realises the situation and leaves. Maria and Capt Von Trapp are married to the delight of his children. Whilst on honeymoon Nazi Germany has annexed Austria and the Capt realises that he would have to serve in the navy of The Third Reich! Before escaping the family are persuaded by Uncle Max to enter the Kalzberg Festival which they win. On their return the family hide in the Abbey gardens before escaping across the mountains to Switzerland to begin a new life together. The action was interspersed with so many well-loved songs including The Sound of Music, My Favourite Things, Do-Re-Mi, Climb Ev’ry Mountain and So Long, Farewell. The final performance on Wednesday produced some stunning performances. Maria played by Ayesha Adey embraced this challenging role admirably. She has a beautiful voice and very credibly portrayed her character’s emotional journey from beginning to end. AJ Russell-Sjollema was amazing as Captain Von Trapp. He, too, was able to convincingly convey both sides of his character: the rigid disciplinarian and the gentle lover. AJ has a very powerful voice combined with good acting ability. Another performance worthy of mention was that of Amie Sullivan who played the Baroness. She was able to convey her disapproval and growing jealousy of Maria with her very expressive facial expressions which left the audience in no doubt of her feelings. The students who played the Von Trapp children brought great energy to their combined roles, with excellent dancing, acting and singing. 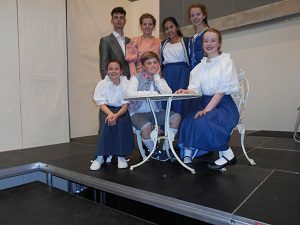 They were Liesl played by Janette Osan, Louisa played by Alana Lynch, Freidrick played by Dylan Thurley, Brigitta played by Ella Child, Kurt played by Edward Britton, Marta played by Sienna O’Connor and Gretl played by Elizabeth Gallup. The orchestra, made up of students from Years 8, 9 and 10, were directed by Miss D Jankauskaite, Head of Music, and Miss S Rottman provided vocal cover. The majority of the costumes were designed and made by Mr Jonathan Clift and were based on the original stage production. The Stage Management team were led by Miss E Neal.